How do I brew a perfect cup of tea ? Good quality water and proper brewing time are essential for a flavorful cup of tea. Start with a preheated pot or cup(simply fill your teapot or cup with very hot water and let it stand for a moment). Use fresh cold water. In areas with poor tap water, use bottled or filtered water. Never use water from the hot water from the tap. Let tap water run for a few seconds until it is quite cold; this ensures that the water aerated (full of oxygen) to release the full flavor of the tea leaves. Bring water to a rolling boil. 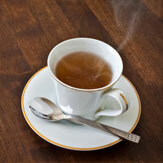 Don't let it boil too long, as it will boil away the flavor releasing oxygen and results in a flat tasting cup of tea. Pour boiling water on tea leaves or tea bag. Brew 3 to 5 minutes (for green teas, water should be a bit cooler and only steep for one to three minutes). How much loose tea should I use to make a cup of tea? To make an 8 ounce (250 ml) cup of tea, use the following chart as a guideline. Adjust to taste. Take fresh water and boil . Warm teapot by rising out with hot water. 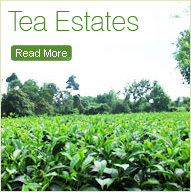 Put one teaspoonful of tea leaf for each cup into teapot. Pour boiling water into it. Cover and wait for three minutes. Give more time for bigger leaf teas. Pour liquid tea from the teapot into cup. Add milk and sugar to taste. A tempter at all times ! Into a piping hot cup of tea, add a few drops of lemon (not milk) and sugar to taste, stir, and sip , and sip in the goodness of tea with the richness of lemon. Take fresh water and boil. Put teaspoonful of tea into teapot for each person to get strong brew. Cover teapot and wait for at least five minutes. Fill three-fourths of a large glass tumbler with ice cubes. Pour tea from the teapot. Add sugar syrup and sliced lemon to taste, but no milk. You can add a spring of mint. Cool for a few minutes and imbibe straight or through a straw. 11/2 ounces cognac, 4 ounces cold, strong tea. Mix lemon juices, sugar and aromatic bitters in the bottom of a tall (12 ounces) glass. Fill glass with ice cubes and pour in tea. Stir. Garnish with lemon slice and spring of mint. Squeeze juice of 1/2 lemon into a highball glass. Add 11/2 teaspoons sugar. Stir to dissolve. Fill with cracked ice. Add 11/2 oz. rum. Fill with iced tea. Stir Garnish with spring of mint. Combine the ingredients in a large pitcher. Chill well before serving. Add spices to water and bring to boil. Pour onto the tea and allow to brew for 5 minutes. Stir, strain onto the sugar and stir until dissolved. Add the fruit juices. To reheat before serving, if necessary, place over a low heat - do not simmer or boil. Serve with cinnamon sticks. This is a very nice after dinner liquor, but you may drink it any time you want to. If the tea flavor is too strong, try steeping for a shorter time, cutting down on the amount etc. Likewise, the amount of sugar may be a bit excessive for tastes so experiment. Steep the tea in the rum for 24 hours, and remove. Make the sugar syrup by boiling 1 cup of sugar in 1/2 cup water (it will be VERY thick ). When the syrup cools, add to the rum. It's ready to drink immediately.